Salad burnet is a bushy, perennial plant produces nearly evergreen, fernlike foliage; 1-2 feet tall, the leaves compound, leaflets 7-15, toothed. Tiny purplish red (almost crimson) flowers, in oval or thickly rounded heads; blooms May to October. Maine to Minnesota, escaped elsewhere, mostly cultivated in herb gardens. The wild variety grows in England, especially in Huntingdon, Northamptonshire and near London. Dislikes high ground, preferring the moister soil of low, sheltered valleys. 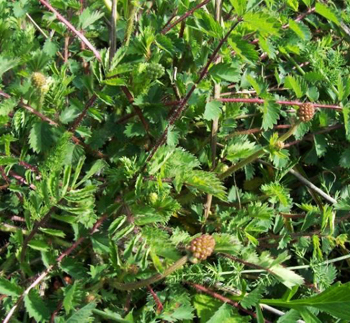 Salad burnet has a nutty flavor that hints of cucumber, and is similar to borage in its taste and uses. Add to salads, cold drinks, soups, cream cheese, vinegar, or use as a garnish. Must use fresh leaves. Makes a tea from fresh or dried leaves, served hot or cold; once was used to flavor wine. Said to be taken as protection of the Plague and other contagious diseases in Pliny’s day. The botanical name (Latin sanguis = blood) refers to its ability to staunch bleeding of wounds. 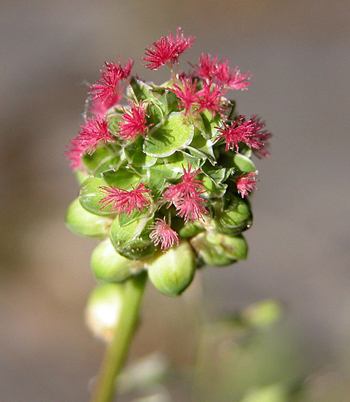 Another species of burnet actually goes by the name of salad burnet (Potaerium sanguisorba). Leaf tea used for fevers and as a styptic. American soldiers drank tea before battles in the Revolutionary War to prevent bleeding if they were wounded. Root tea stops menstrual bleeding, bleeding from piles, dysentery; externally, for sores, swelling, canker sores, ulcers, moist skin ailments, wounds, burns. Powdered root used for 2nd and 3rd degree burns. Pound the leaves into pulp and spread on a clean piece of bandage or lint. Apply as a poultice. Contains tannins, contraindicated for burns in Western medicine.